Every year since 2006 we’ve put on a day of Conversation Analysis talks at Loughborough University, under the aegis of the Discourse and Rhetoric Group (DARG). This year, the 9th, was another happy mix of the scholarly and the convivial. A subsequent guest blog will give an attender’s-eye view, but in the meantime here are some reflections from us as organisers. The first thing to say is that CA is in very rude health: once again the demand for registration was very strong, and the submissions to present papers were of high quality. That meshes with our experience of other conferences and meetings, large and small, over the last decade: a lot of people like what CA does, and want to see more of it, be it out of conviction or curiosity. Being an informal, rather end-of-term gathering, we could mix the presentations to showcase established authorities (like Rose McCabe, on CA and psychiatric consultation) and rising stars. A surprising but welcome feature was the range of work on medical interaction – as well as McCabe on psychiatry, we had intriguing presentations on dentistry from Lewis Hyland, doctor-doctor consulatins from Marzia Saglietti and a team led by Fiona Stevenson; and, rather movingly, Ruth Parry and Marco Pino on end-of-life conversations between hospice doctors and terminal patients in their care. The medical strand was perhaps a consequence of the (comparative!) ease, or lesser difficulty, of attracting research funding; but it is good stuff, and speaks well for CA’s robustness as it moves from private study to public application. Among the other stand-out presentations were Kobin Kendrick on the universality of expansion sequences, and Sue Speer on the ambiguity of flirting, (including some squirm-inducing videoclips, always a bonus in a conference prsesentation). As organisers we could take great pleasure in seeing some young, early-career researchers start to announce themselves to the CA tribe. Talks by Hatice Ergul, Marika Helisten, Angeliki Balantani and Brian Due covered topics all the way from assessments and accountability to activity resumption and object-passing, respectively. An audience of 60 peers and seniors would normally be daunting, but the friendliness of the occasion (helped by an exceptionally well-provisioned cake contest) calmed nerves. We also had a prize draw for a couple of blockbuster CA titles, kindly donated by the publishers – we rigged it so that only doctoral students could win, but don’t tell anyone. Next year will be our tenth. 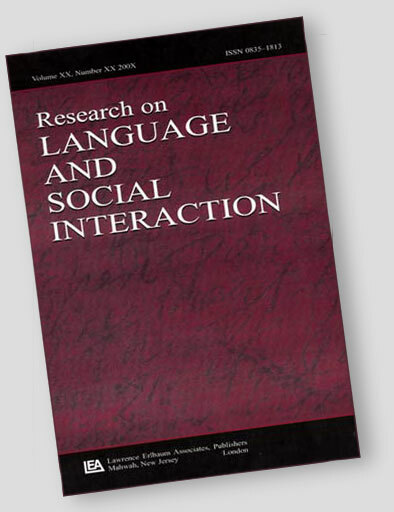 Each year we think up a suitably broad title to fly under – we have had such permissive themes as “Interaction and Home and at Work”, “Structures of Action” and “Conversational Sequences”, in a bid to attract all comers. 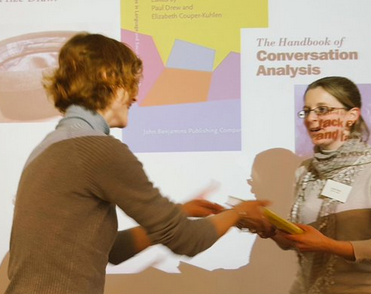 For the 10th anniversary meeting, perhaps we’ll just stick with “The Pleasures of Conversation Analysis“. That’ll capture it pretty well. Charles Antaki and Liz Stokoe, with thanks to our team of postgraduate volunteers: Marc Alexander, Kat Connabeer, Joe Ford, Emily Hofstetter and Bogdana Huma.